In your case, get a 0.2 mm dermaroller and a 1.5 mm dermastamp. It depends what you mean by "thickness". The needles of all our miconedling instruments have a conic shape. The tip of the needles is very much thinner that the base of the needles. They are a 0.25 mm thick at the base. The tip is much thinner. The gradualness of the tip of the needle is called "taper". The single needles have an extra long taper, which mean they have a long and very thin tip. Our dermastamps as far as I know have a long taper (not an extra long taper). When I have time I will compare the two under the microscope. It depends whether your scars are real scars or just enlarged pores. Pores are ducts in the skin and there is currently no method that can significantly and permanently make pores smaller. Very many of our customers improved their scars with microneedling but only a few succeeded in reducing their pore size (they used various microneedling approaches so there is no single recommended method). No, in this case a 0.2 mm roller is not intended to enhance the penetration of skin products. A 0.2 mm, if used long-term, thickens the epidermis and that could theoretically make pores smaller and it usually improves the overall skin texture and tone. A dermastamp is for your deeper scars but you can try to use it on a small area of your face with "pores" and see what happens. The reason why your pores dilated may be due to hormonal stimulation (during adolescence) of the sebaceous glands that are inside the pores. If the gland enlarges, the pores usually enlarge as well. The skin becomes oilier then. The biggest injustice is that as we age, our sebaceous glands are slowly becoming larger but in spite of that they produce less and less oil. So we end up with dry, wrinkly skin with large pores. Any skin changes the days after dermarolling are only temporary and will eventually go back to normal. Keep the skin moisturized. If you use the single needles, the redness after needling can last in some rare cases up to several weeks. That questuion is impossible to answer, it's like answering "how long is a piece of string". No worries, we like large photos, the bigger the better, then the details are better visible. PDT (Photodynamic therapy) selectively destroys tissue. A photosensitizing substance is applied onto the skin. The substance is absorbed in larger quantities by certain cells, such as the sebaceous glands or cancerous cells, which makes them much more sensitive to the applied light. The applied light will cause the release of reactive oxygen species that will injure or destroy the tissue that contains the most of the light sensitizing substance, leaving the surrounding tissue undamaged. In this way, you can reduce the size of sebaceous glands by damaging them and thus reducing the overproduction of sebum, which is the main cause of acne. So, yes, the results should last. Maybe the sebaceous glands will eventually recover and grow back to their original size (especially if you have high levels of androgen hormones since androgens "encourage" the activity of sebaceous glands) but it will take a long time, hopefully. 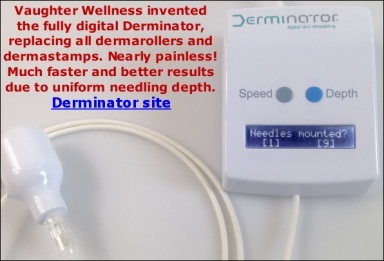 Concerning your scars, I recommend you a 0.2 mm regular dermaroller (you can roll ever second day) and a 1.5 mm dermastamp (stamp every three weeks). You should wait at least three weeks after the PDT therapy. Read our instructions for the rolling technique. What type of acne scars do you have and how deep are they? A 2 mm dermastamp + the single needles + the suction method is the most "aggressive" treatment for acne scars and you should certainly try it for at least a year. CO2 laser resurfacing and a subcision are also very "intensive" treatments and I am surprised you got no results. Rolling in a star pattern is not recommended any more. Rolling back-and-forth without lifting the roller is not recommended anymore. We discovered that the way nearly everybody rolls is responsible for the infamous "scratches"
pricks in the skin. Both are undesirable effects. You should roll the area about ten times vertically and ten times horizontally. This is just a general rule that can be adjusted to your preferences and the reaction of your skin. The exact recommended rolling technique is descripbed in our instructions. You can roll a single "time" horizontally and a single "time" vertically if you space the roller each time a few mm apart, as described in our latest dermarolling instructions. The longer the needles, the more careful you have to be, especially if you roll the face- roll slowly and thoroughly. Rolling the face for two to three minutes with a 0.2 mm size is enough. Thank you very much for your feedback and for your praise!